The coconut tree is sometimes touted as the tree of life especially for countries in Southeast Asia. Almost all parts of the tree can be used. The leaves and fronds are used for many handicrafts and all sorts of matting material. The roots have some use in cooking. The tree trunk is nowadays used for cheap coco lumber. The fruit of course has a 1001 uses - mostly for cooking, eating and beverage. Its usage extends even at the stage when the spent fruit is already considered agricultural waste. Previously, I only saw discarded coconut husks and shells as fuel material for cooking in an outdoor stove. Well, no more. The photo above shows how half a coconut shell works well as a garden pot for an Adenium obesum. Notice how the bluish garden stone's uneven surface cradles the rounded bottom of the coconut shell and prevents it from rocking. A garden pot needs to have drainage holes and the shell has these pores, sometimes called "eyes", where water can drain out. 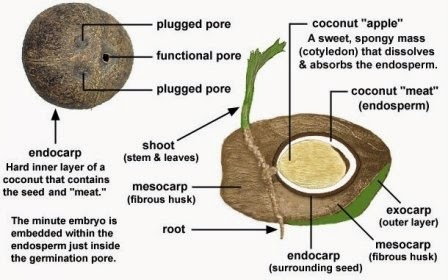 In germination, the functional pore in the endocarp allows sprouting of the coconut shoot from inside the seed. See the illustration below. The shell being referenced in the illustration above is called the endocarp. The endocarp is the tough covering of the coconut's meat. Unlike the husk part, or the mesocarp, the endocarp is very hard and will not rot as quickly. The shell as a garden pot measures anywhere from 5 to 8 inches in diameter and can easily contain most small plants. The natural earth color of this garden pot lends a rustic color to any garden. It doesn't need to be painted and may be used as is. Coconut shell half - This is readily available in the wet market area of select Asian markets. Nail - 2 to 4 inches, 1 pc. Plastic caps or cans - To be used as improvised support and drain tray. Ensure most of the white coconut meat (endosperm, in the illustration above) has been removed. Scrape out any sizeable bits still attached to the inside of the shell. Remove, by pulling out, any loose fibers of the husk (mesocarp) still attached to the outside of the shell. The functional pore of the shell may sometimes be adequate for a drainage hole. For bigger shells, you may need to punch out the plugged pores of the shell as additional drain holes. With a hammer and a nail, punch these pores. Shown below is the bottom of the garden pot showing a functional pore (drainage hole) and the 2 plugged pores. Because of its round bottom, you will need a support to keep the shell stable and at the same time double as a drain tray. 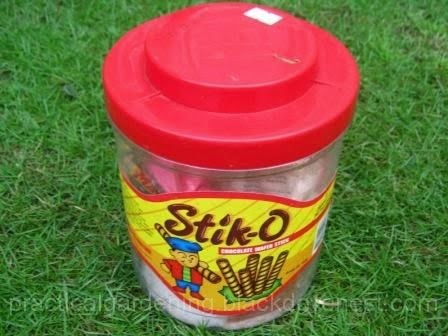 Shown below is a kids' snack jar with a plastic cap, which can be used as an improvised drainage tray. Remove the plastic cap from the jar, invert it and and position it under the garden pot. 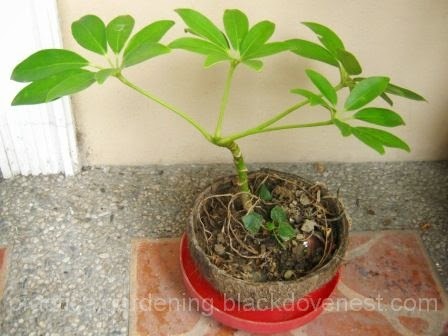 Here's how the improvised drainage tray supports the garden pot with a growing Schefflera arboricola or Umbrella tree plant. Here's a way to add interest to the plants in the garden pots. Vary the height of the plants by using different lengths of pvc pipes. Shown below are two 4-inch diameter pieces, which were previously painted.